As we approach the end of another year, I want to wish all of my tribe the very best for the coming one. I hope it brings good fortune, a renewal in spirit and good health to everyone. As a New Year’s special gift, I am making the Kindle copy of Funeral Singer: A Song for Marielle a free download for December 31st and January 1st, so if you haven’t gotten a copy yet, here’s your opportunity to get it FREE. If you would kindly write an honest review after you read the book and submit it to Amazon, I would truly appreciate it. Please feel free to share this offer with your friends and help me spread the word about my debut novel. Thank you. Another year has almost flown and we’re fully into the celebrations of the season. However, you celebrate, I hope that your holidays are filled with love, joy and lots of good food. It has been a very good year for me as a writer. My romantic alter ego, Riona Kelly, just published Bitter Vintage, a suspense romance novel set in the California vineyards in 1964. I don’t think it’s too much of a secret that I use pen names. So, if any of you like suspense romance, check this one out. It’s a fun, fast-moving tale of intrigue, greed and treachery among the grapevines. The other side of it is that I’m now free to move ahead with the first rewrite of my next Funeral Singer novel, A Song for Menafee. I completed the first draft in November and I’m ready to tackle the next phase of it. I have a little research to do and then I’ll be moving ahead. Right now, I am targeting publication in mid-June. So, be patient, more tales of Gillian and her friends are on the way. 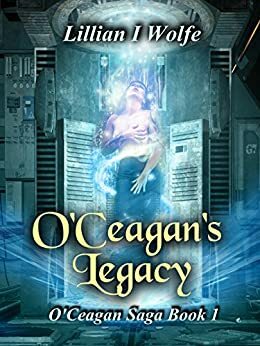 More immediately, I am planning the release of my long-delayed science fiction fantasy novel, O’Ceagan’s Legacy. From Pynhavyn Press, we’ve just revealed the cover and I adore it. I think it captures the spirit of the story, pun intended, beautifully. The novel touches on Irish legends and brings you along for an unusual and exciting ride with a spacer family from Erinnua (New Ireland) on their merchant freighter, the Mo Croidhe. The planned release date is March 12, 2016, so it will be along soon. Work continues on my Young Adult novels, a series called Isles of Magic and the first book is written and resting a bit before I tackle the rewrite. It’s no secret that I love the Celtic lands, particularly Ireland and Wales, so this series of books will take you to these lovely places. The plan is to publish the first of the books in 2016. Thanks for sticking with me this year. I hope your holiday stockings are filled with delightful, mysterious and wonderful good books to read. I just finished my second round of NaNoWriMo, as any of you who have been following me on Facebook probably know. It’s a fun event in November to promote National Novel Writing Month with an attempt by writers to pound out 50,000 words of a novel within the month. It seems like a lot of words and it is a challenge, but if you go into it prepared and with a little support from friends and other writers, something magical happens. The Reno, Nevada group has a strong showing of writers and many of them are on the NaNo-Reno Facebook page, which offers support to the members during this event. When I say support, I mean they are online and posting encouraging words, cheering you on and doing writing sprints with you. Believe me, that little challenge of how many words can you write in 30 minutes really spurs you to get those words on paper and they come out surprisingly cohesive. The challenges kick in that competitive nature and you get an adrenaline rush while writing. We held a few write-ins where the writers could get together, chat, drink coffee and write. To be honest, they aren’t quite as productive as the online sprints, but you do get to know the rest of the local writers and that is a plus. Writing can be a solitary business so it helps to meet others who face the same challenges and are encouraging. If you’re stuck in the plot, sometimes they can offer suggestions. By the way, collectively, Northern Nevada writers pounded out a whopping 5,794,528 words during November. I took the count at a little before midnight on the 30th. Well done, Reno writers! I did this for the first time last year. I had an outline for a book, Funeral Singer: A Song for Marielle and a pretty good idea of how the story would unfold. On day one, I tore into the story and by the middle of the month I’d passed the 50,000 word mark, finishing the first draft of 62,000 plus words by Nov. 15th. What I had to do to make it happen was to turn off my inner editor, the one that likes to stop and analyze everything, then hunt for the perfect word or rephrase something two or three times before proceeding with the next paragraph. This is what stalls my writing. I went a webinar with Joanna Penn on how to use Scrivener while writing your NaNo novel and getting the story down, letting your thoughts flow, was what she stressed. Really, the concept is pretty simple. Let your creative side go crazy and allow the characters go wherever they choose to go, within reason, during the first draft. If you can do that, you can capture the basics of your novel — the characters, the plot, the twists and the key elements. The revision draft that you will do later in December or January will be the one that will enhance, tune, trim and make your novel a cohesive and compelling (you hope) read. It’s not as easy to do as it sounds, but once you wrap your mind around the idea that you’re not going to worry about anything you say, typos or other issues that tend to slow your writing down, you can do it. In 2014, I not only finished the first draft of A Song for Marielle, I also started a young adult novel to continue adding to my word count. I got up to about 82,000 words by the end of November. This year, I wanted to beat that word count and I also wanted to write the second book of the Funeral Singer novel, A Song for Menafee. In November, I had Reno’s Comic Con on the schedule for three days, which I also had in 2014, and I had a three day trip to San Francisco to see Josh Groban, which would impact my writing time . The roomie and I took the bus to San Francisco and I used some of the time on the bus to write, although having a Chatty Cathy across the aisle the whole trip made it hard to concentrate on the writing while going out. Then having Sleeping Beast using my shoulder for a pillow on the way back tended to really put a damper on writing. But I still managed a respectable amount those days and I finished my first draft of Menafee on November 11. I then started the second novel, a suspense romance (which will be published eventually under Riona Kelly) and got another 30,000 plus words done on it before the last day of November. I ended up writing 91,062 words in November. I’m not going to say they are all good words or that the novels are fit to be published, certainly not in the shape they are in after the frenzy of writing. I am about one-third through the second novel so that needs to be finished. It is currently without a title and is being referred to as The Spanish Story. But I have one new novel completed and ready to be revised in the next couple of months, which will then go to beta readers. After that will be the editing and other revisions, then, with luck, to publication by early summer. That’s the plan at the moment. It’s exciting. The main takeaway from NaNo is realizing that if you can write like that in November, you can do it anytime. You just need to challenge yourself, have a story plan, set aside time to write every day, and do it. When I finished last year, I didn’t write anything new for several days until I thought, I should be writing. It’s becoming a habit, a much desired habit.